The Values Project is a year-long initiative designed to equip families to raise children who thrive emotionally, socially, and spiritually. Get inspiration, practical ideas, family activities, and parenting tips from our network of seasoned parents and faith leaders, because it takes a village to raise a good human. 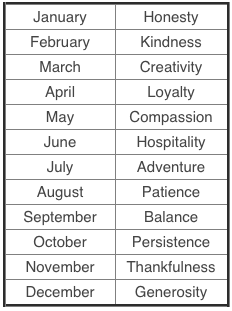 Each month we’ll explore a different value–like honesty, loyalty, creativity, kindness, and more. Sign up here to receive our monthly newsletter and stay engaged with more great content like this. Sparkhouse Family is an imprint of 1517 Media. 1517 Media creates multimedia resources and distinctive books for Christian communities, students, scholars, and the general reader. 1517 Media’s imprints include: Augsburg Fortress, Sparkhouse Family, Fortress Press, and Sparkhouse. Join us each month as we explore a new value!